84 (Coventry Airport) Squadron Air Training Corps: 2014 Christmas BagPack: The Results are in! 2014 Christmas BagPack: The Results are in! Congratulations to all the cadets who worked extremely hard in the annual bagpacking fundraiser before Christmas 2014. The grand total raised was an impressive £1638.55!!!! 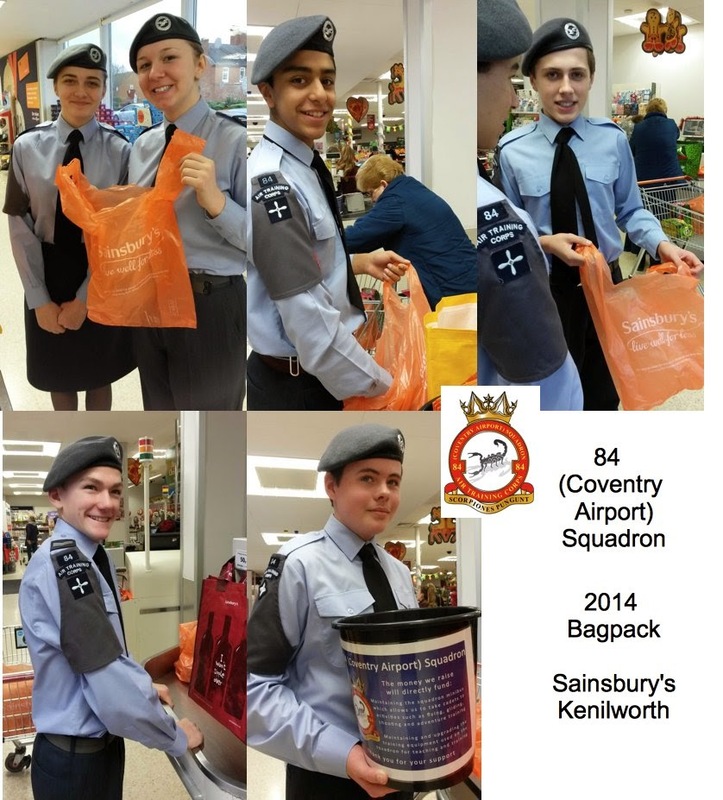 On Saturday 20th and Sunday 21st of December 2014, cadets from 84 Squadron took up their places at the end of the busy checkouts at the Sainsbury's store in Kenilworth offering assistance to customers in packing their bags. The weekend was busy and the flow of both routine and Christmas shoppers through the store was non-stop but the cadets worked hard split into shifts to cover all available tills throughout the day. Many customers commented on smartness and professionalism of the cadets and how much easier they had made the shopping experience. Sainsbury's staff and management added their praise commenting that the cadets not only offered an excellent service to the customers with a personal touch but also helped to keep the queues down to a minimum with the increase in sales over the busy festive period. Supervising the cadets across the weekend was Flying Officer Rosie Chapman (Royal Air Force Volunteer Reserve (Training)) who said, "I am always amazed by the generosity of the general public and the positive comments received about our cadets not only reflects the high standard of young adults at 84 Squadron but also within the entire organisation. I am very privileged to be part of this amazing unit and would like to thank you to all those who contributed to the fantastic result".